I’m in love with Asian cuisine. Specifically the Eastern and Southeastern Asian cuisine. I love the complexity of the flavors — fresh and sweet and savory and spicy all in one single bite. The more I try the cuisine, the more I love it. I really feel like I get a taste for the culture of the region with every dish. I have this theory (I think it is a pretty common one) that traditional food in any nation is the food of their poorest people. Using every part of the animal and local ingredients that are simple to grow — I think that is never more evident than it is in Asian cuisine. I would love to drop everything and travel the world exploring the connection between poverty and traditional cuisine. But alas, no can do. Flickr Tag Error: Call to display photo '4907596262' failed. I am priviledged to live in a region of the United States that has extremely high quality authentic food from the many regions of Asia. Montgomery County, MD has the highest percentage of Chinese ancestry in any place besides California and Hawaii. Northern Virginia has some of the largest populations nationwide of Vietnamese Americans. Annandale, VA specifically has a rapidly growing Korean population and is home to one of the nation’s Koreatowns. Virginia and Maryland both are in the 10 Top states with the highest Thai populations in the country. Why am I telling you this? Because it means I have phenomenal food from the many regions of China, Vietnam, Korea, and Thailand right in my backyard. How did I get so lucky? I could live entirely on the cuisine of those nations. I crave it constantly. I cannot understand when someone says, “Eh, I had Thai two nights ago so I don’t want Korean tonight.” WHAT?! They are totally different! But fine. As you wish. I cannot remember a time in my life when I did not adore this food. Learning to cook this cuisine is often quite difficult. Unlike learning to make a pot roast or learning to roast a chicken, there is so much about cooking this cuisine that is built in to a person’s being. Watch a show where they feature a cook from Thailand, Vietnam, Korea, China or any of the other nations of the Far East. It is often the way they move their hands or the decades-old kitchen tools or just the way they know when something is perfect. I can make a Thai-style curry. I even learned from a great Thai chef in the area. But it will never ever be the same no matter how many times I try… and I vow to try a LOT. In fact, my mother-in-law once opened my refrigerator and commented that it looked like an Asian restaurant. I took that as a compliment. I always have fish sauce, chili paste, miso paste, sesame oil, soy sauce, Sriracha, rice vinegar, mirin, sweet chili sauce, and oyster sauce in my fridge. There is usually a jar of kimchi too. Open my pantry and you’ll find at least 3 different types of noodles not including the Italian style pasta. My freezer? Packed full of frozen dumplings and buns for steaming. I love it all and I crave it all the time. Learning to cook it… I think the key is starting slowly. Finding the right ingredients for many dishes is tricky but possible if you have Asian markets in your area. But there are some dishes where you can usually find everything you need in your local farmers’ market and grocery store. Cook the noodles per the directions on the package. Rinse and allow them to cool. Put all of the other ingredients (not the garnish) in a bowl and whisk until it is all combined and smooth. This might take a lot of whisking, but you’ll get there. Taste it. Awesome? Should be. You can adjust the flavors to your taste. You can serve this at room temperature or put it in the fridge to chill. It is great served immediately or saved as leftovers. I love this dish. It is wonderfully flavorful AND it is a great dish for those nights when it is just too hot for a warm meal. The rice noodles get blanched, not boiled. Boil a pot of water. Once it boils, remove from the heat and add the noodles. Often times the noodles come in little bundles — I used two bundles for 4 rolls and had some leftover. They should sit in the water for only about 5 minutes or so. Check to see if they are soft — if not, let the soak longer. Then remove them and rinse under cold water. Leave them in the strainer to dry. You should slice the cucumber and pepper into thin matchsticks. To do that, slice the top and bottom off the pepper. Slice the pepper-hoop in half to open it up and slice thinly. You see the fancy chefs on tv cut peppers this way a lot. For the cukes, just slice long-ways into sheets and then again into thin strips and then cut those strips in half so they are short. It doesn’t have to be perfect; it just has to fit. I bought shrimp that were already steamed and cleaned. Just be sure to remove the tails. Soak the wrappers in warm water until they are pliable. You will feel them go from feeling like paper to feeling like soft delicate wrappers very quickly. Be careful with them! Lay the soft wrapper on a flat surface. Add some noodles, cucumber, pepper, a few shrimp (I fit 3 in each), and some leaves of Thai basil and/or mint. Fold in the sides first and then roll — just like a burrito. Mine were way too loose and were a little hard to handle, so next time I’ll try to roll them tighter. For the dipping sauce: I used some of the sauce from the cold noodles above and a little sweet chili sauce mixed together. If you don’t have sweet chili sauce, the peanut sauce above would be great alone. Can’t find wrappers or don’t feel like it is worth the effort? Deconstructed spring rolls are also great (I did this with the leftover ingredients): noodles with cucumber, red pepper, shrimp, and Thai basil with a little bit of the sauce. These are fresh and delicious! My husband said they tasted just like the ones from the restaurant. 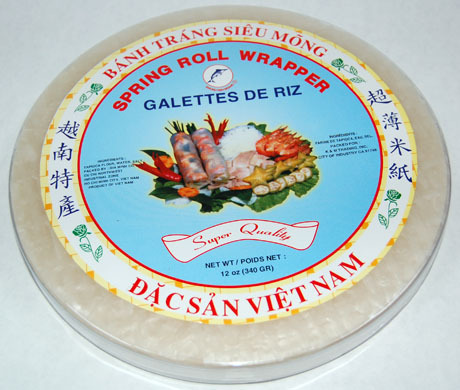 Successfully making these summer rolls was a HUGE deal for me! (Did you see the photo above? Did you?? DID YOU???) It was a very proud moment. You can make this for me anytime (sans shrimp). Mmmmmm.